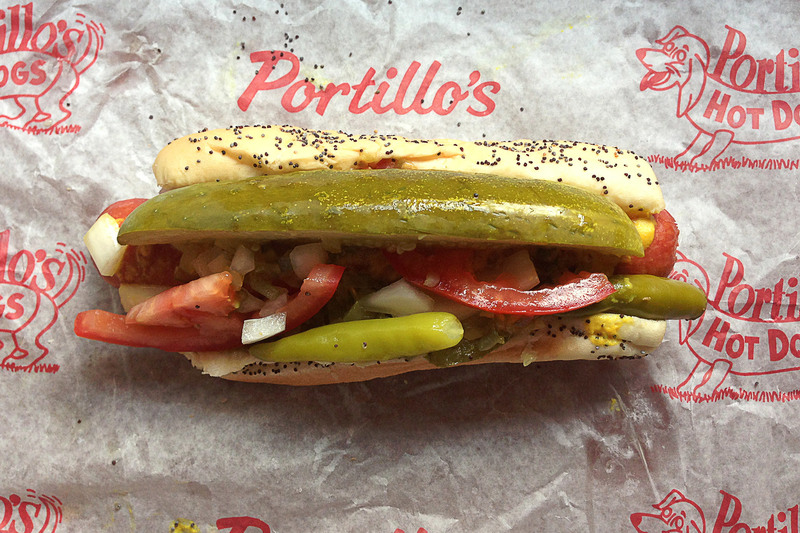 There's no denying that the hot dog is a major food group in Chicago, right next to Chicago deep dish pizza. 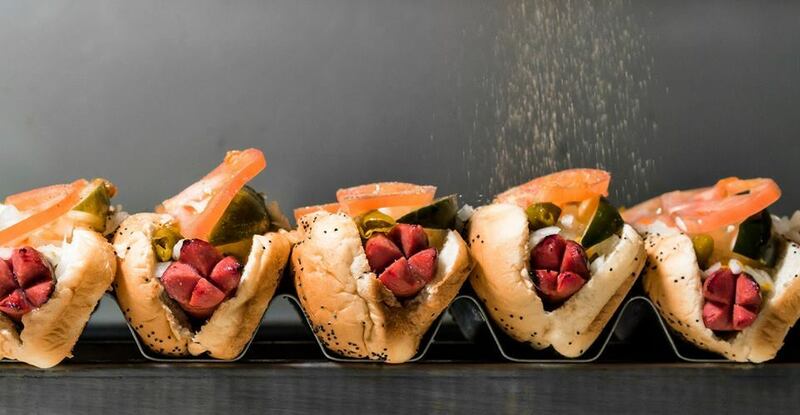 The best Chicago hot dog restaurants crank out red hots topped with mustard, onions, relish, pickle spears, tomato, sport peppers and celery salt. 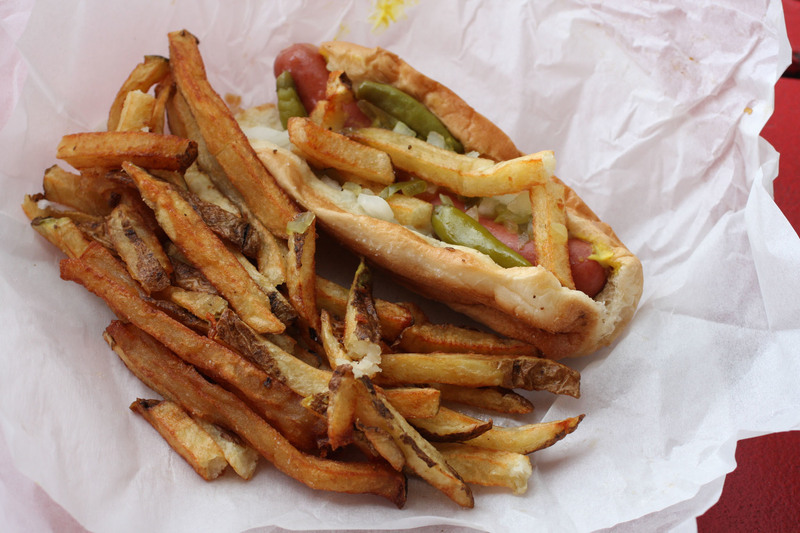 (If you didn't already know, those are the key ingredients in a true Chicago-style dog.) 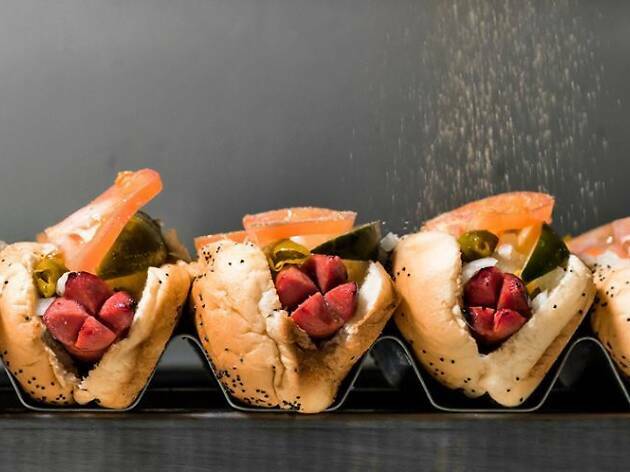 Of course, there's room for creativity, and many of the top Chicago hot dog restaurants also experiment with toppings like foie gras, kimchi and even—gasp!—ketchup. 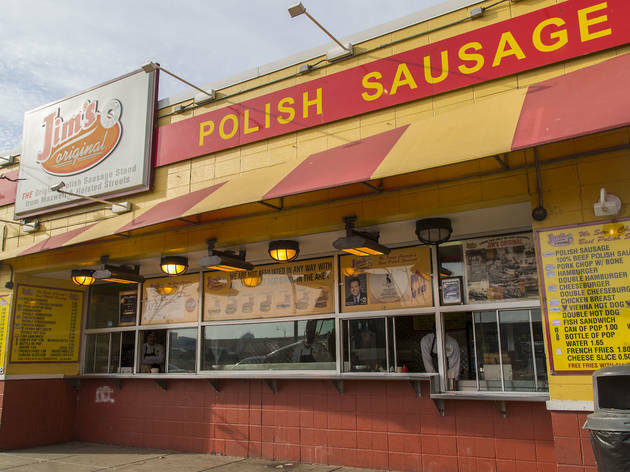 Lucky for you and your wallet, these sausages are among the best cheap eats in Chicago—even more reason to scarf down a red hot while checking out classic Chicago attractions. 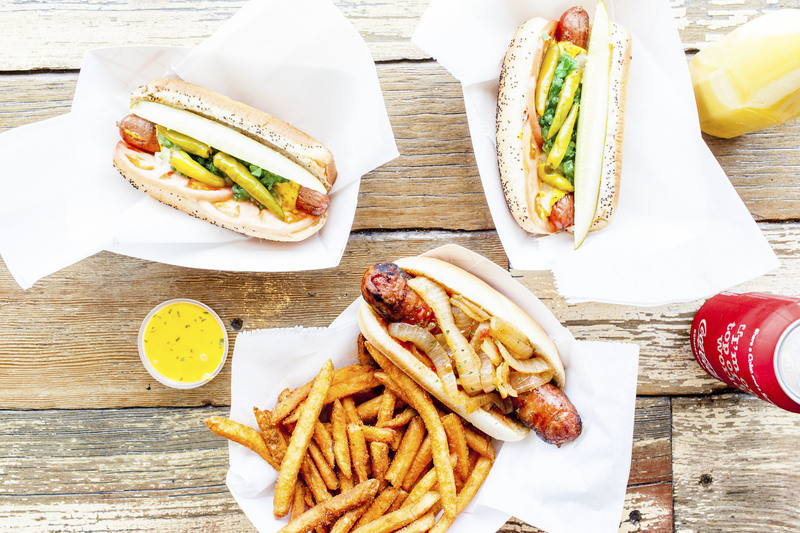 Scope out the best Chicago hot dog restaurants and don't forget that mustard is the best condiment and that fries are always encouraged. 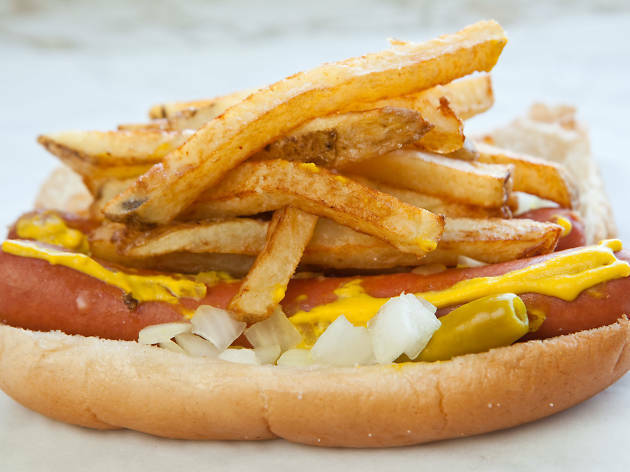 Don't ask for ketchup when you order one of the legendary dogs that come topped with a fistful of fries at this standing-room-only institution that’s been serving ’em up since 1946. The surly types behind the counter don’t go for weak stuff like that. Claim your place at the end of the perpetually long line and entertain yourself by watching potatoes being cut and fried into perfect greasy strips while you wait. Once it’s your turn, order your dog with everything, then count your blessings for the wax paper–wrapped bliss that lies before you. 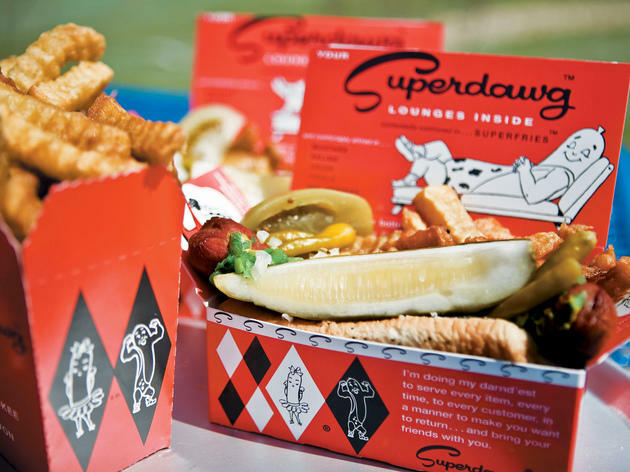 Despite a renovation in 1999, this hot dog drive-in is still as old-fashioned as ever, with uniformed servers bringing your order directly to your car window. 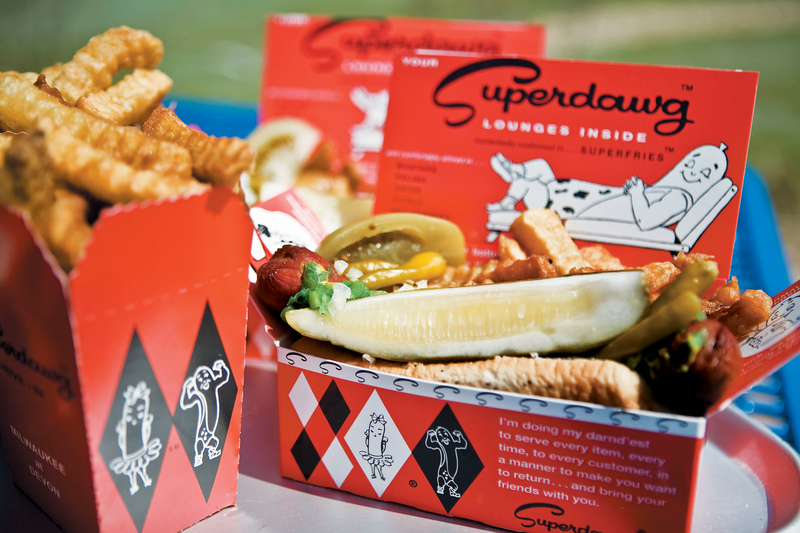 Apparently scared of copycats, the owners have trademarked almost every dish, the main draw being the namesake “Superdawg,” an all-beef frank so plump it’s hard to remove it from its cartoon-covered box. After a meal of hot dogs, fries, burgers (try the delicious, double-decker “Whoopercheesie”) and “Supershakes” (actually not very super), expect to literally roll yourself home. 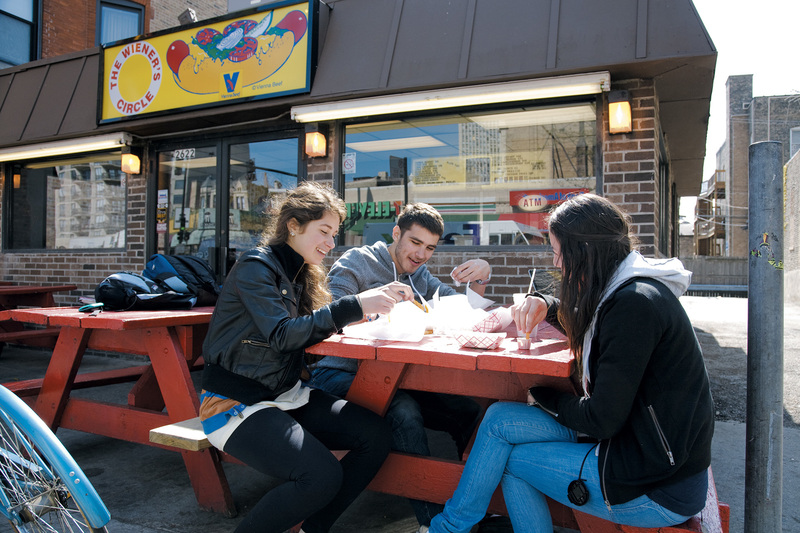 Unlike many of the names on this list, the Duck Inn isn't a hot dog stand. 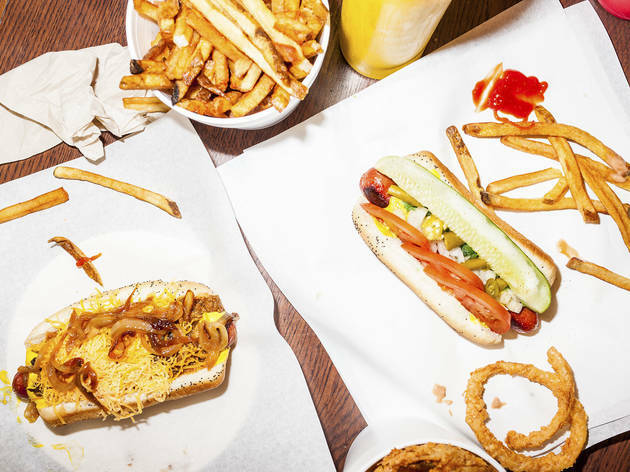 Still, the Bridgeport restaurant serves an upgraded version of the classic Chicago-style hot dog that's worthy of your attention. 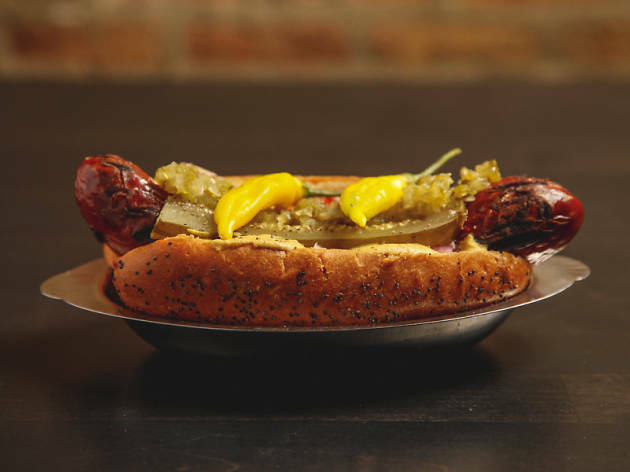 True to its name, the weiner is a blend of beef and duck fat that's grilled and topped with house-made mustard and relish, pickled hot peppers, tomatoes, onions, a pickle spear and a dash of celery salt. It's all stuffed inside a squishy brioche poppy seed bun, which is a real game-changer. In the pantheon of Chicago hot dog stands, Wolfy’s deserves a seat on the dais. 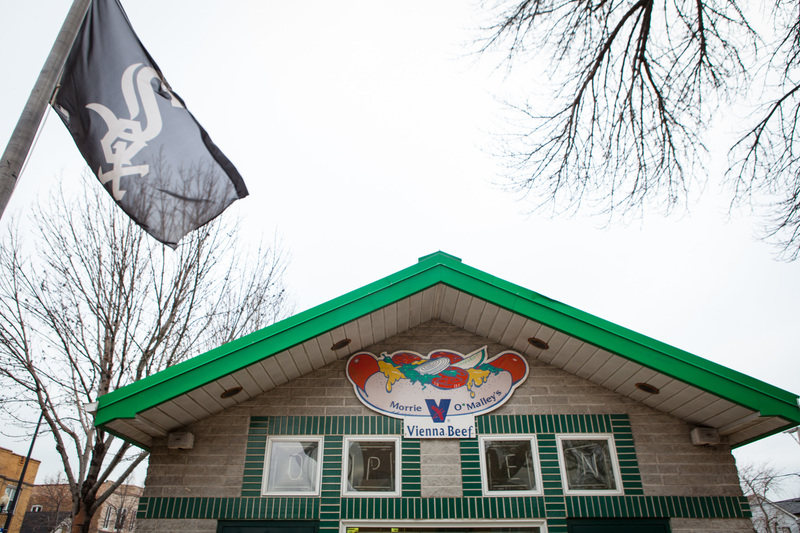 The room is sparkling clean and the staff is sweet—think of it as the anti–Wieners Circle. Though it offers a lot more, take a cue from the iconic signage (an impaled hot dog on a sparkling fork) and stick to the sausages. 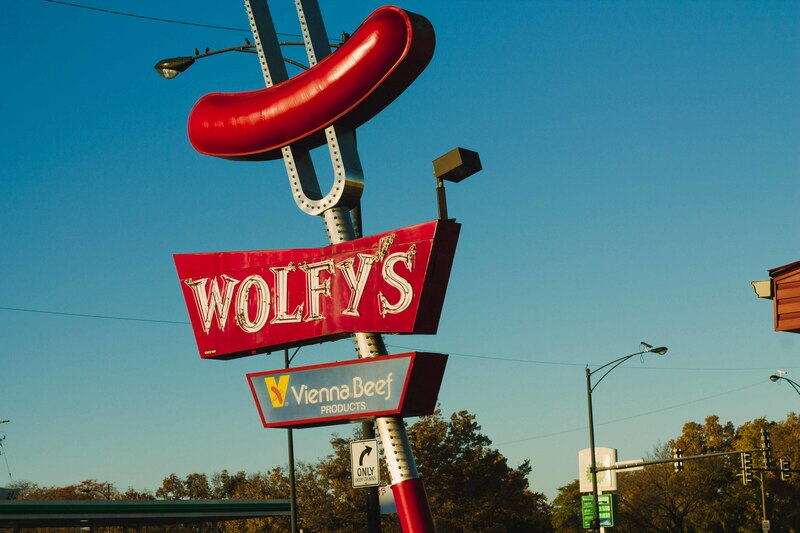 The Vienna beef char-grilled Polish is near perfect, but it’s Wolfy’s hot dog, one of the best in the city, that will make even the most jaded hot dog fan smile. There’s no denying that this über-efficient local chain serves a damn good weiner. 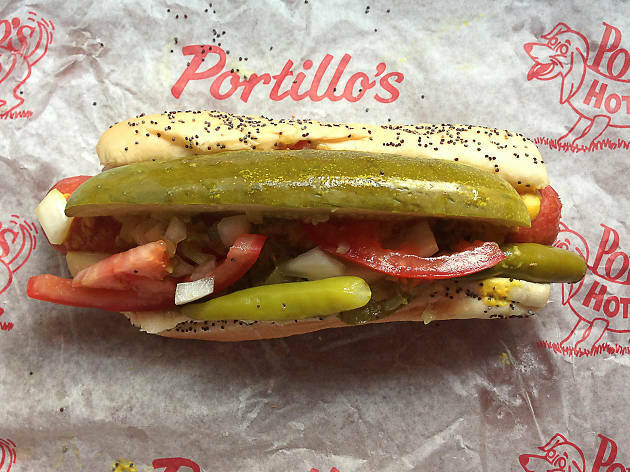 With locations in River North and the South Loop (and another coming soon to Avondale), Portillo’s pays homage to the Midwest with classic Chicago-style hot dogs as well as chili-cheese dogs and a char-grilled Maxwell Street Polish sausage. The M.O. at Redhot Ranch is minimal selection and flawless execution. 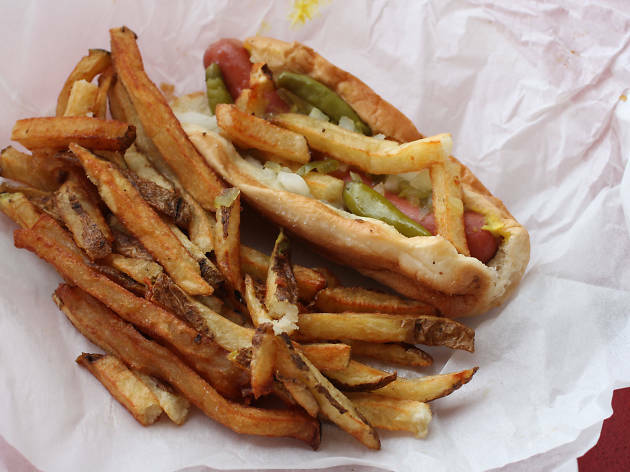 Juicy depression dogs (a stripped down version of the Chicago-style dog topped with mustard, onions, relish and sport peppers) are served with fresh-cut fries that are crisp on the outside and pillowy inside. Dining with a group? Toss in a pound of French-fried shrimp for the table. It’s all served until 4am on weekdays and 5am on weekends. 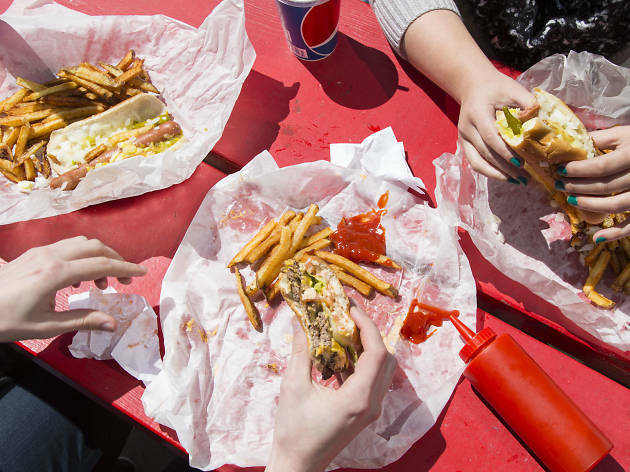 True to its name, Fatso’s isn’t for the faint of heart. The menu is rife with stoner-friendly fare like smash burgers, milkshakes, mac ‘n’ cheese and a loaded Italian beef. The hot dogs here are charred instead of steamed, evoking memories of backyard barbecues and summertime pool parties. They’ve also got a deep-fried veggie dog on the menu—because even vegetarians should pig out every once in a while. 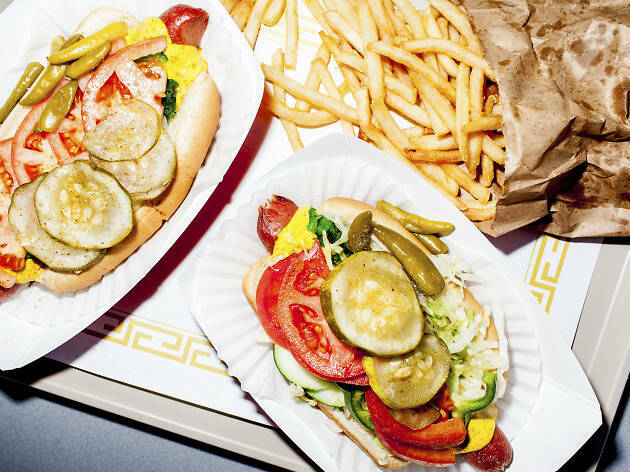 Doug Sohn’s influence looms large over Chicago, so it makes sense that Octavio Garcia and Juan Carlos Garcia, former Hot Doug’s cooks, took their knowledge and opened Hot “G” Dog in Uptown, basically reincarnating the original. Down to the duck fat fries on weekends, “G” is the same. The Andouille is still “mighty hot!” The duck sausage, with medallions of foie gras, truffle aioli and fleur de sel, faithfully recreates Sohn’s most famous sausage, created to flout the foie gras ban. There are also specialty sausages, like chorizo with pico de gallo and smoked shrimp with remoulade sauce. 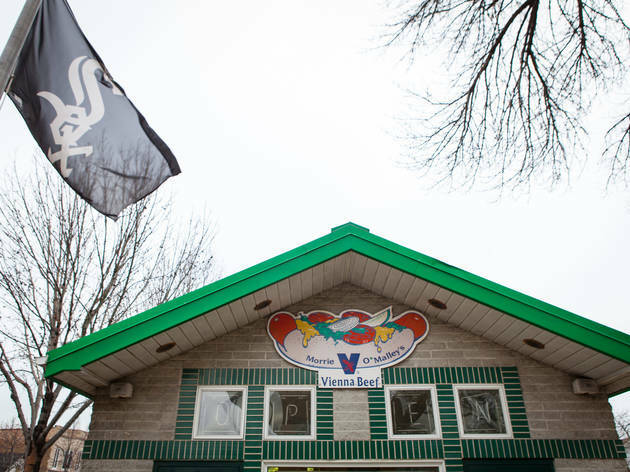 This seasonal South Side joint is just begging for a Sox home game and a warm day. 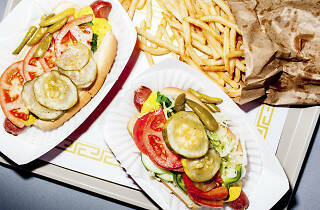 Here you'll find some flawless, fully loaded hot dogs, but consider those just the tip of the jam-packed menu. 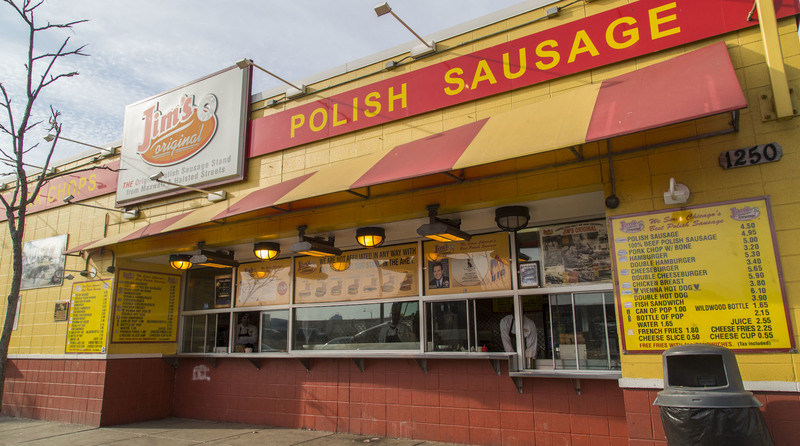 Sure, you can go for a Polish or a hamburger, but don't skip some of the other oddball creations, like the A1-drenched charbroiled strip steak sandwich. 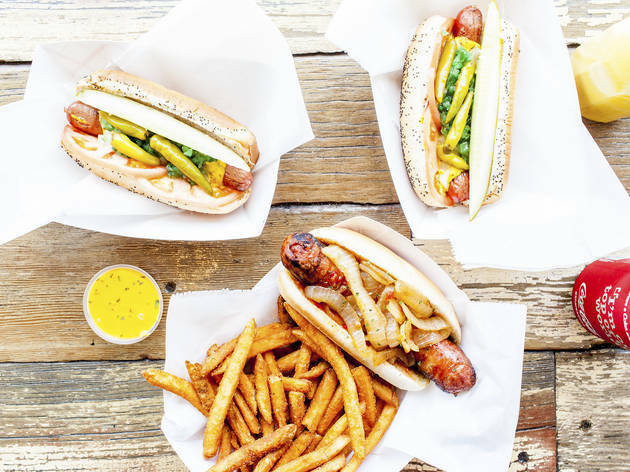 This Lincoln Park shop serves a by-the-books Chicago dog with all the standard toppings, but we're always eyeing the cheeky specialty sausages. The wagyu beef dog is topped with pepper relish, jalapeños and cilantro, while the apple brandy duck sausage comes loaded with Swiss cheese, Dijon mustard and caramelized onions. 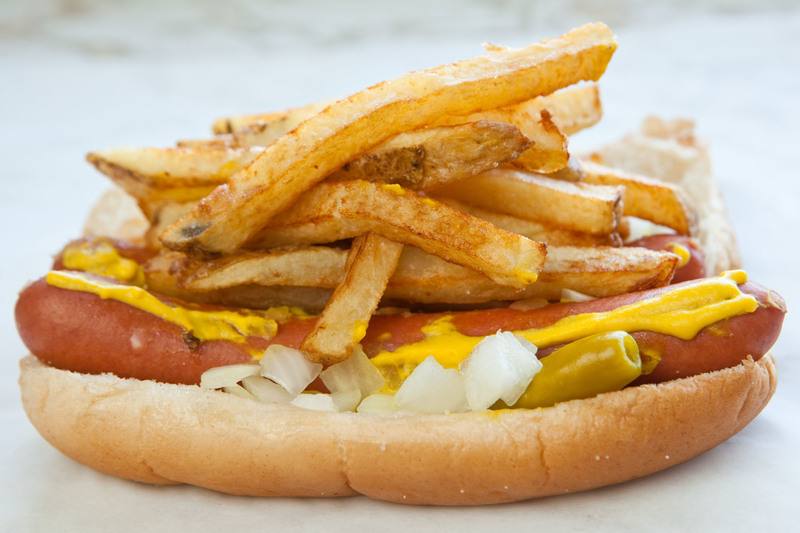 And then there's the LOL-worthy Blagojevich—a typical Chicago red hot that includes ketchup. A little walk-up shack on the UIC Campus with no seating, Jim's Original doesn't look like much. But a solid rendition of a Vienna beef Chicago-style dog with fries sets you back just $4, and the grilled onions are a nice touch. 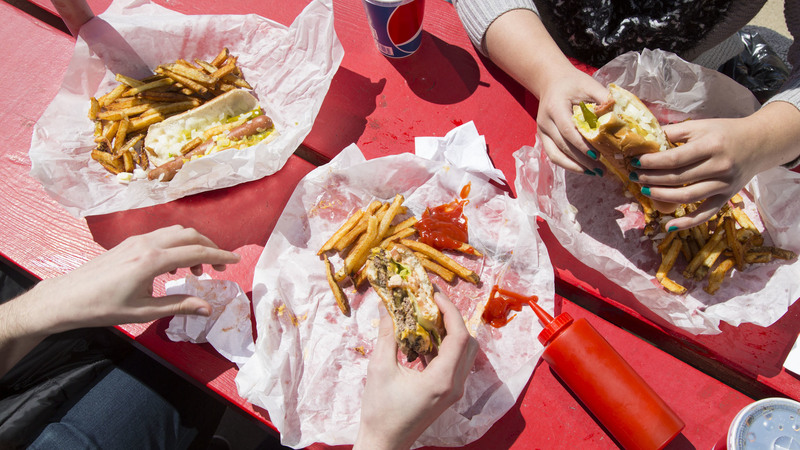 Open 24 hours a day, Jim's Original is just as good for lunch as late night munchies. It's way past your bedtime on a Friday night, or is it Saturday morning? Doesn't matter. Devil Dawgs is here to tempt you with a laundry list of loaded hot dogs. They've got Chicago dogs, Coney dogs, New York dogs and even Seoul dogs, which are topped with shoyu-soy mustard and kimchi. Pick your poison and toss in a fresh strawberry shake while you're at it. 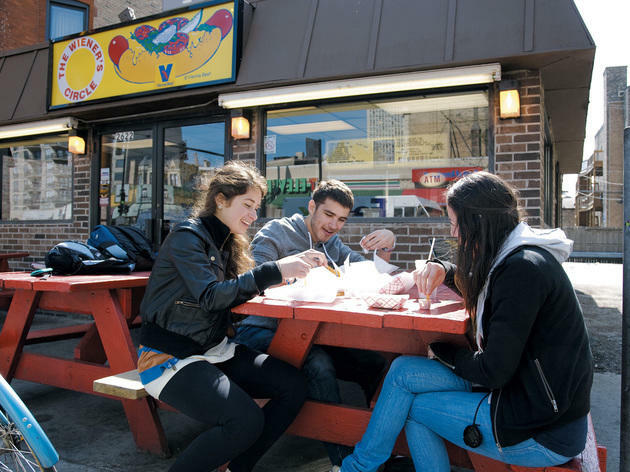 Like Gene & Jude’s, Jimmy’s is a purist’s hot dog stand. No seating, no char-anything, and for crissakes, no ketchup. You’ll find nothing but tasty Vienna beef hot dogs and Polishes served on steamed buns with loads of greasy, hand-cut fries. As a consolation for the much-maligned ketchup lover, Jimmy’s offers a decent house-made habanero hot sauce. This spot is open late, which is the best time to catch sketchy parking lot antics. The folks behind the counter at this classic roadside shack have had enough of drunk yuppies' crap. So much so that they’ve developed their own brand of smack-talking that’s now synonymous with a late-night dog run here. 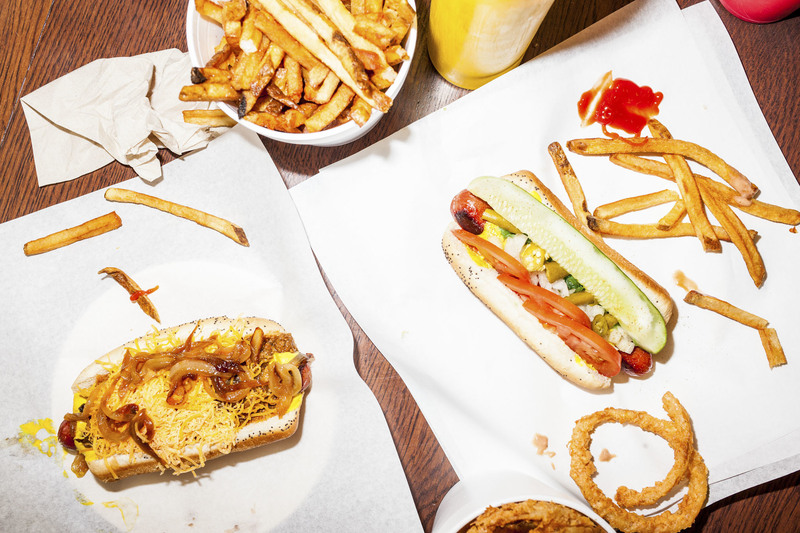 Get your Chicago red hot with the traditional fixings—mustard, onion, neon-green relish, pickle spear, tomato, celery salt and sport peppers—an order of thick-cut fries, a big, fat lemonade and some verbal abuse. 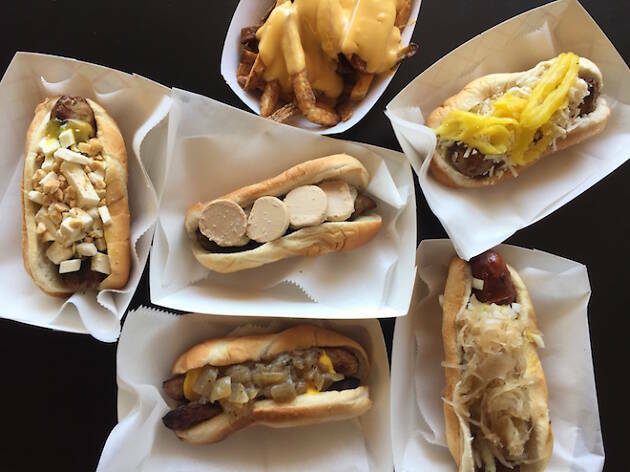 This grab-and-go spot in Irving Park dishes out Vienna Beef hot dogs, Polishes and bratwursts with killer French fries—crispy, salty and packed with grease to help wash down whatever it is you ordered. Be prepared to pick your toppings, or if you're just not sure, get everything. You won't regret it.